Barclaycard presents British Summer Time Hyde Park announces more final additions to the already-stunning festival lineups this summer. Today we announce some of pop’s most exciting prospects to support Take That on Saturday July 9th. Already a hugely popular day, the final remaining tickets are selling out fast. Pop’s newest single-name rising star Grace raced into the UK Top 5 last November with her smoky cover of Lesley Gore’s ‘You Don’t Own Me’ – produced by the legendary Quincy Jones, no less. The 18-year old Australian songstress described by Billboard as possessing “the toughness of Janis Joplin and the sultry moodiness of Joss Stone” is sure to win over music lovers in Hyde Park this summer. 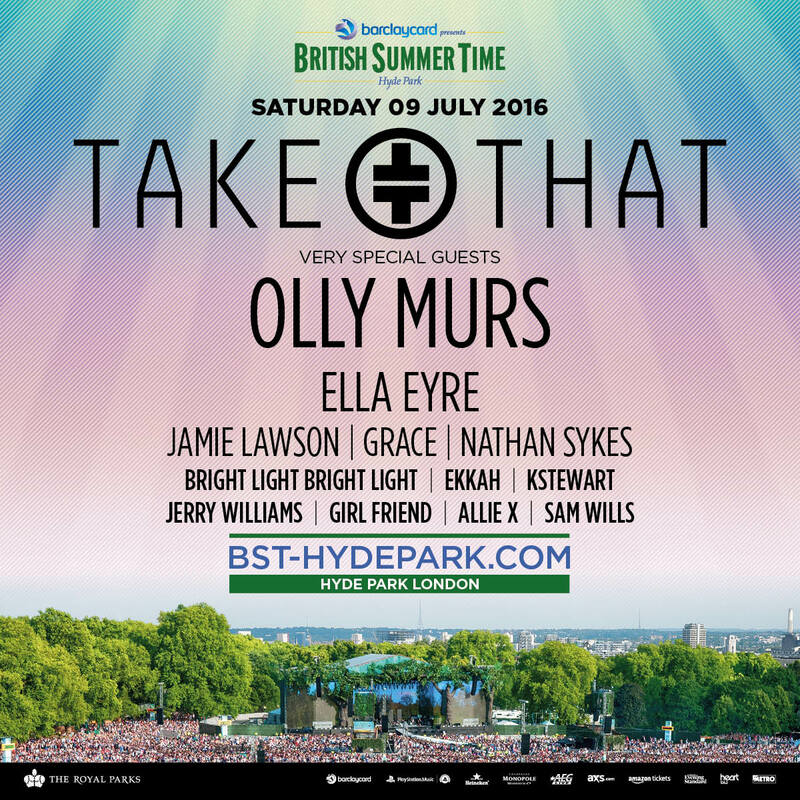 Following their stunning debut performance in Hyde Park last year, BST 2016 sees Bright Light Bright Light and Ekkah return to the stage to support Take That, Olly Murs and Ella Eyre. Still buzzing from his landmark performance on The Graham Norton Show with Elton John last month, independent synthpop artist Bright Light Bright Light is back with new tunes. The Welsh rising star will perform tracks from his latest album Choreography, which drops on 8 July. Ekkah, a formidable duo championed by the Daily Telegraph and Wonderland, are known for their delicious mix of funk, soul, disco and R&B. The pair just premiered their cosmic nod-to-the-80s double A-side single: ‘What’s Up’ and ‘Space Between Us’. West London’s KStewart burst onto the scene last year with her bass-in-your-face track “Keeping You Up”. This year she teamed up with MNEK for 90s revivalist banger “Be Without You” and although the song surfaced in chilly February, it has a distinctly summery vibe about it that we can’t wait to dance to in Hyde Park. Electro-pop band Girl Friend are another act confirmed to support Take That on the second Saturday night of the festival. The Manchester-based band’s synth-driven harmonies and soaring vocals are sure to strike a chord with audiences this summer. 20 year-old Jerry Williams also joins join in. Having recently released her debut EP “A Hairdressers Named Sids”, the guitar-wielding troubadour creates sugar-sweet indie pop with lyrics reminiscent of a Kate Nash era gone by. When Katy Perry christened Allie X’s debut track “Catch” as her “spring jam” on Twitter, the young LA songstress’s career went through the roof. With her second album in the pipeline, X’s macabre lyrics mixed with her upbeat 80s pop sound is the perfect soundtrack to summer come rain or shine. Neo-soul singer Sam Wills completes the gliterry Take That support roster. Armed with a confident EP – So Bright – praised by Complex UK and The Line of Best Fit, it is easy to see why the 23-year old talent from Hastings will shine bright on this line-up. 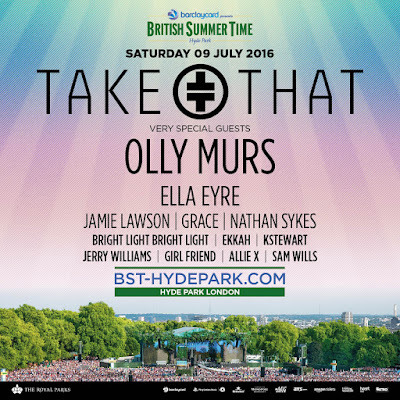 Barclaycard presents British Summer Time Hyde Park hits its fourth year in 2016, firmly established as the essential London summer event. This year sees the following artists headlining: Massive Attack (1st July), Florence & the Machine/Kendrick Lamar (2nd July), Carole King (3rd July), Mumford & Sons (8th July), Take That (9th July) and Stevie Wonder (10th July).